Talking about the best way to cook farro is a bit like talking about the best place to have a colonoscopy; useful information, perhaps, but not anything to get excited about. Hey, I shared your feelings until I had the privilege of cooking with the great American chef Suzanne Goin at the LA Times Book Festival last April. 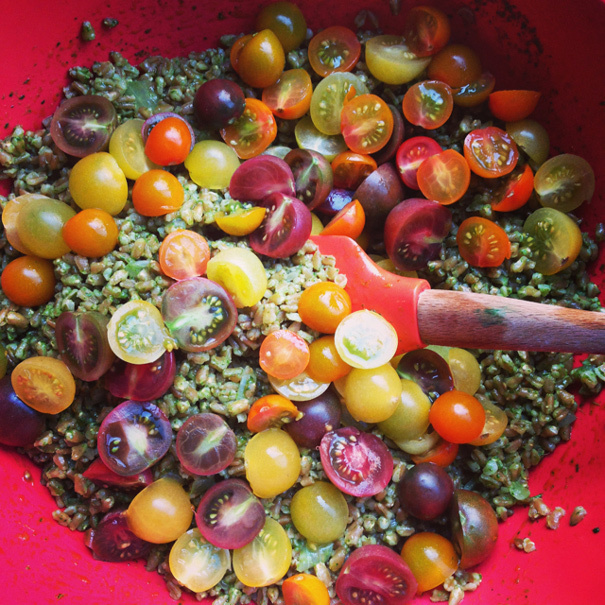 Right in front of my eyes, she prepared a farro salad with a garlic and parsley dressing that wasn’t punishing in any way; in fact, it was quite the opposite: light and herbal and fluffy and fragrant. The most shocking part? 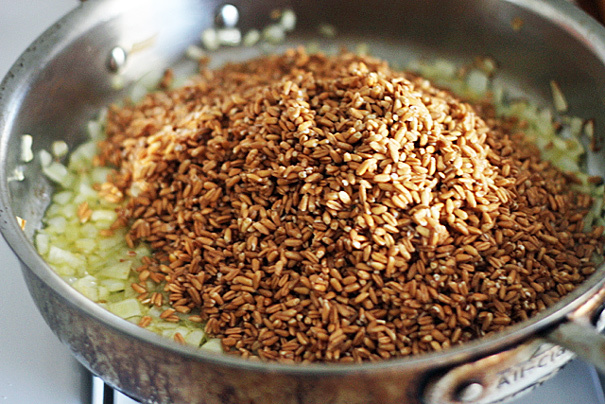 The highlight was the farro itself; each grain stood apart and was both tender and toothsome in a way most farro isn’t. I knew I had to learn the Suzanne Goin method for making it. When the onion is translucent, a few minutes later, you add your farro: Chef Goin’s recipe calls for two cups, I used three which, as you’ll see momentarily, was a mistake. (I just wanted to have a lot of farro for the week; sue me.) 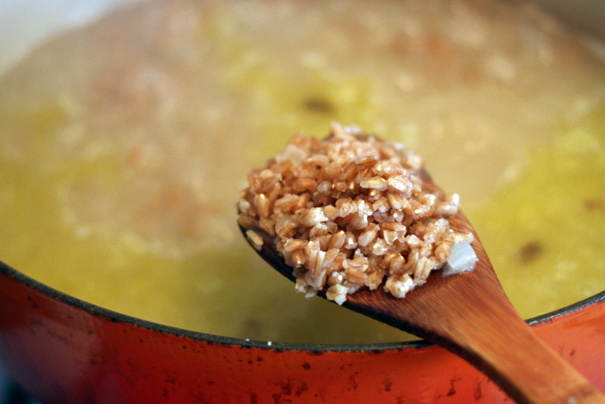 You stir it all around and let the farro toast in the hot oil. That, it turns out, is the reason Chef Goin’s farro is so good: each kernel gets flavored with the oniony oil and, also, just like with risotto, this helps keep each grain distinct, rather than part of a mushy mass. At this point, you add your water and salt. I realized, because I’d added that extra cup of farro, that I didn’t have enough room in my skillet anymore. Stop judging. So I transferred to a Dutch oven, no harm done, and allowed the water to simmer for 30 minutes or so until the farro started to split open and tasting a spoonful of kernels revealed that they were done (and delicious!). Now if you want to go full-on Goin, you drain your farro in a colander and then dump it on to a cookie sheet to cool. While that’s happening, you can make your dressing. 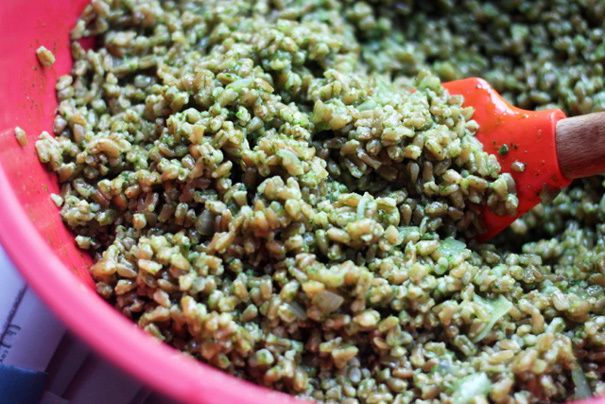 This is a great dressing for farro: lots of parsley, some garlic, lemon juice, and olive oil. What can I say? 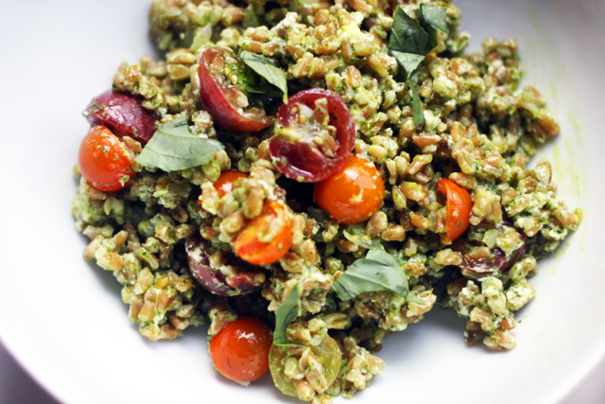 This farro puts all other farro to shame. And turns out my mistake–making too much–wasn’t a mistake at all; now I get to eat farro all week while you eat sushi from the supermarket and schedule your colonoscopy appointment. Looks like farro and I have the last laugh after all. Summary: Adapted from Suzanne Goin’s A.O.C. Cookbook. 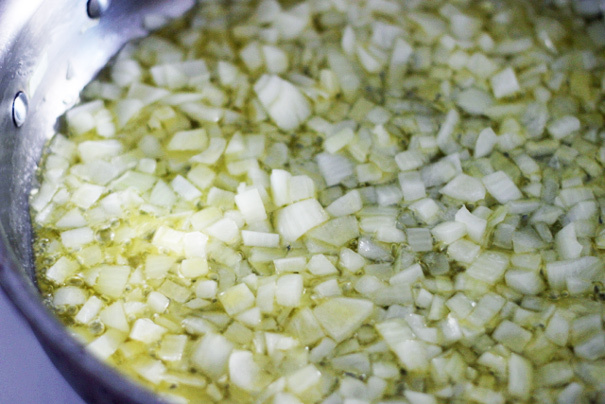 In a large saucepan, heat the 3 tablespoons of olive oil until hot and add the onion with a pinch of salt. Cook on medium heat until the onion is translucent, then add your farro (if you rinse it first, make sure to shake off all the liquid). 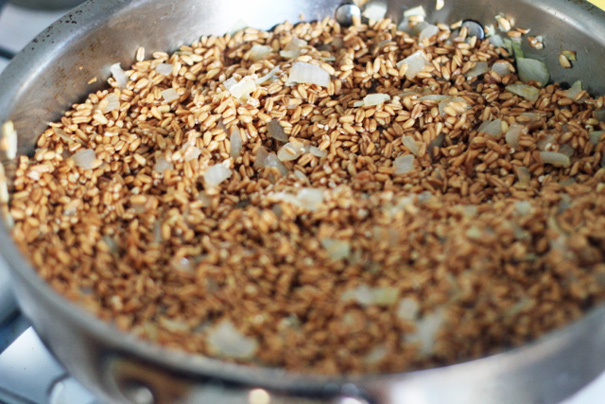 Toast the farro in the hot oil for a minute, stirring all the while, and then add 10 cups of water and 2 teaspoons kosher salt. Bring to a boil, turn the heat to low, and simmer for about 30 minutes, until the farro is tender and just cooked through. 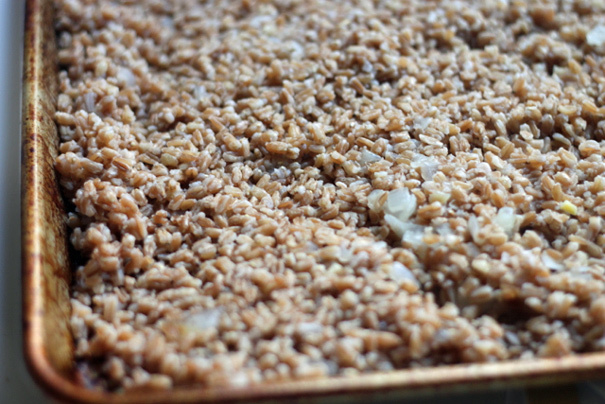 Strain the farro and transfer to a baking sheet to cool. To make the dressing, place the parsley, mint or basil (optional), garlic, lemon juice, 1 teaspoon salt, some black pepper, and 1/4 cup olive oil in a blender. 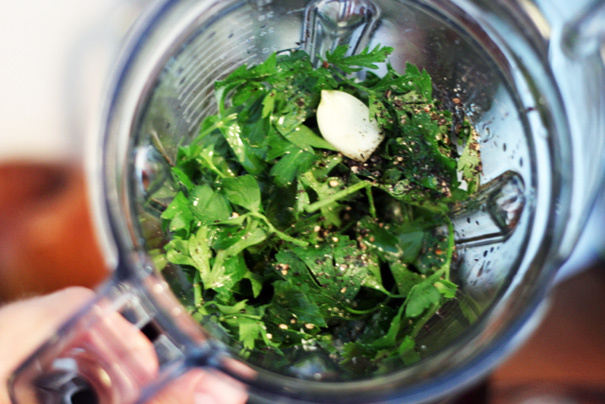 Start to blend on low, then quickly turn up to high, and pour in the rest of the oil. Taste for balance and seasoning (I found mine needed more acid and salt). 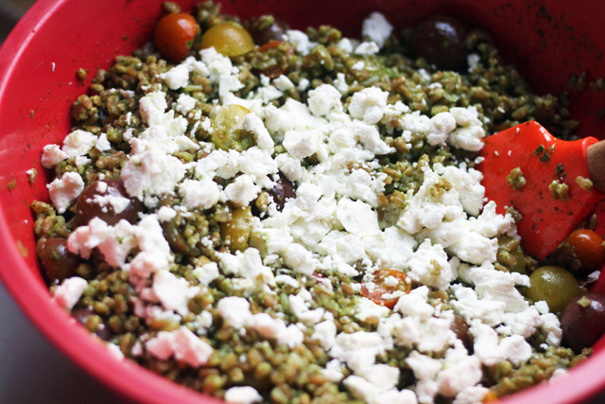 To finish, scoop the cooled farro into a large bowl and dress with the parsley dressing, stirring well to distribute. Now you can add your favorite spring or summer vegetables. Let your imagination run wild! Well, not too wild.